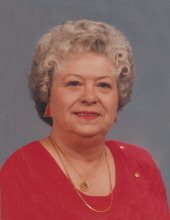 Edith Walker, age 85 of Breckenridge, passed away Monday, January 28, 2019. Funeral services will be held at 10:30 a.m., Friday, February 1st at the Elliott Street Church of Christ with Don Nelson and Jim Cox officiating. Interment will follow in the Breckenridge Cemetery under the direction of Morehart Mortuary. Visitation will be held from 6 p.m. to 7:30 p.m., Thursday, January 31st at Morehart Mortuary. Edith Virginia Stephens was born November 5, 1933 in Snyder, Texas to parents, James Thomas “JT” Stephens and Zada Virginia Cummings Stephens. She attended school in Snyder and married Robert “Bob” Lee Walker, Jr. on November 26, 1950. The Walkers moved to Breckenridge in 1990, when Bob retired. Edith was a member of the Elliott Street Church of Christ and enjoyed playing dominos with her Bible class group. She also loved to sew and bake; often making goodies for the beauty shop she went to every Friday. She was preceded in death by her parents, JT and Zada Stephens; her husband, Robert Walker, Jr.; four siblings, Milton Stephens, Lonnie Stephens, Mardel Stephens, Mildred Flynn. Mrs. Walker is survived by three daughters, Virginia Welsh and husband Barry, Teresa Morris, both of Breckenridge, Rejeanē Moore and husband Randy of Beeville; four siblings, Leonard Stephens, Daphna Worsham, Mary Boyd, Sandra Perkins; nine grandchildren, numerous great grandchildren, nieces and nephews. "Email Address" would like to share the life celebration of Edith Walker. Click on the "link" to go to share a favorite memory or leave a condolence message for the family.